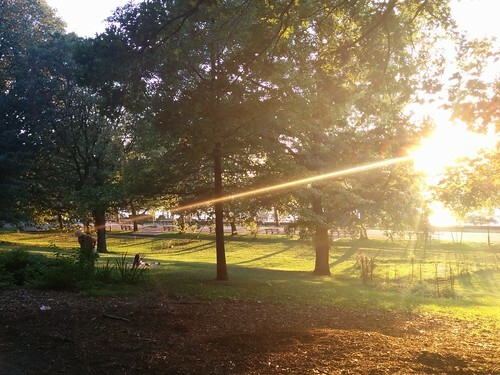 This is not typically a fabulous month but the past 4 or so weeks have exceeded all August expectations. We celebrated Emancipation Day, August 1st with family. There were a lot of new nephew cuddles, and good times with his parents. We stayed with wonderful friends. Their windowsill shows all of my travel spinning of Wensleydale. The people of New York were rather taken-in by my carob Turkish Delight spindle by Jenkins Woodworking. There was also quality time aka aeroplane knitting with a baby gift for our this-week born new cousin in Toronto. 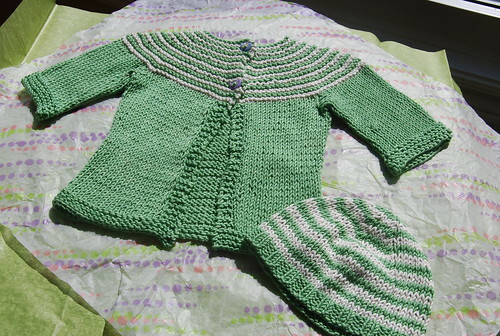 Gidday cardigan set for baby G! This cardigan is Gidday Baby pattern by Georgie Hallam. Can I just whisper, “Gidday pattern!” This was a July 29 – August 9th pleasure of knitting with stashed Sirdar Baby Bamboo yarn. This is an awfully sweet yoke. My main colour is #122 with the contrast in cream. The hat was just as fun to knit and is Louisa Harding’s striped beanie hat. My copy of her Natural Knits for Babies and Moms is much loved & heavily used. 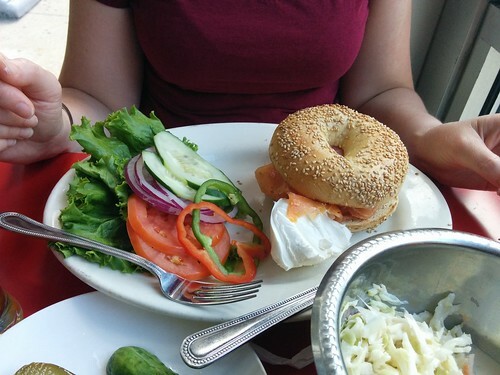 We were well-fed, and soon got over for baby’s first museum visit. The crowds! It’s hard meeting an infant’s needs in those crowds but our new parents did a fine job, and he was pretty cheerful. 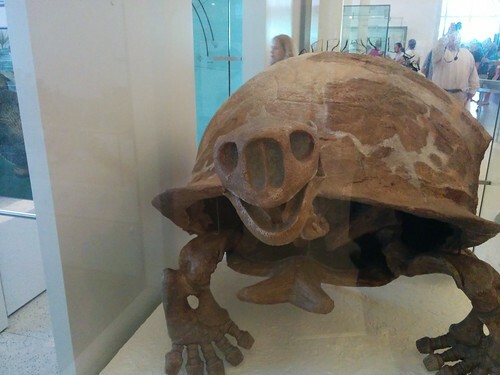 Search engine diving shows this dinosaur as Colossochelys the Pleistocene turtle but I am not sure in retrospect. We were at the American Museum of Natural History. It was such a short but packed trip. I came home with craft books from the Strand Bookstore, a new-to-me set of Meck Russian paddle combs, and wheels that are now on my Mighty Wolf loom. The best part was having such a blast welcoming nephew, F. I think he likes me. Before & after our trip, I participated in a 4-part guild workshop on bead embroidery with William Hodge of Armure Studios. 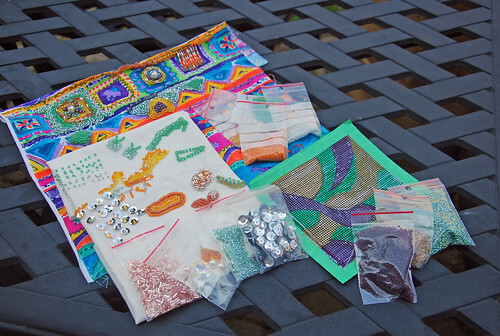 It felt like jumping back into the childhood sandbox of embroidery with crazy bling. Fun but also greedy for time to do even these small amounts. I will never begrudge a handmade bead embroidery work its price again. It’s joyous but where does the time go? Well, I did hear, “Start simply,” but couldn’t stop. Each participant had her own approach. Mine was to follow the instruction about total bead cover and the ’80s patterned fabric. The faux pearl bead to the right has special comedic value. It, ahem, moves of its own volition. William shared many pieces in his personal collection from different cultures as well as his own work. It was fabulous, and I was glad for the breaks between workshop parts. It was just perfect having the Naked Craft exhibition on at the AGB while taking this workshop. 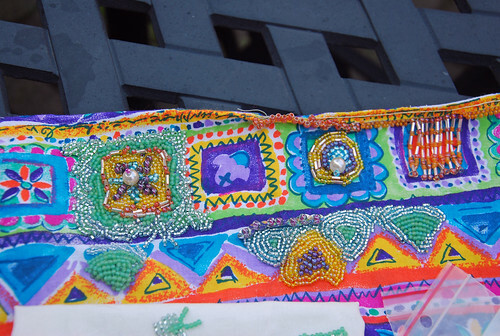 The bead embroidery pieces by contemporary artists are astonishingly beautiful but I also saw the raw commitment – eye-strain, materials, design, time. With thanks to PAKnitWit who ran the aptly named ‘Shawl for All’ knitalong, I used all 756 yards of my superwash merino dyed by Southern Cross Fibres. 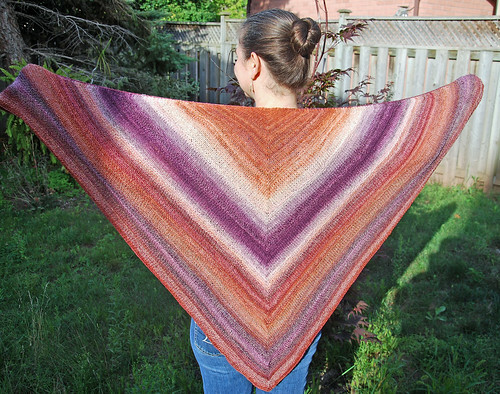 This was 8 of 9 designed sections in Sarah’s Diminishing Returns triangle shawl. I used 3.5 mm needles, and loved each second of this relaxed me-knit. It’s an elegant & simple concept. You move through stockinette & garter stitch blocks that reverse roles. 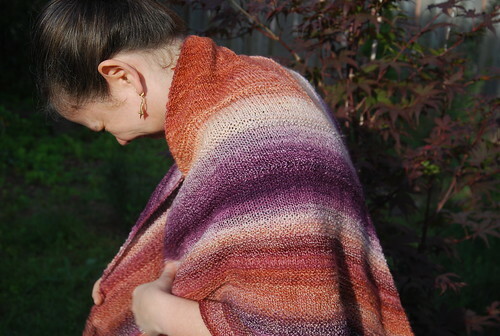 Just right for a strong gradient like my Sugar & Spice 2-ply yarn but the design is very versatile. I hope that others will use handspun yarn to make this pattern too. The knitter gets to keep a lid on the purl stitches as the triangle grows, which I appreciate. 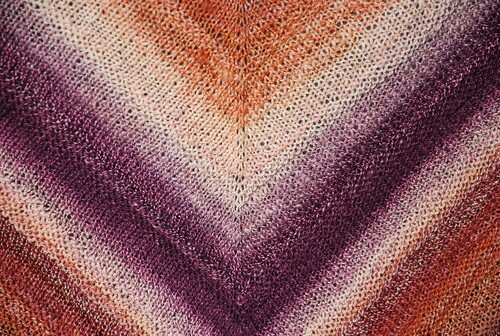 The top-down triangle adds 4 stitches every other row, and that grows quickly! Also appreciated? The length on my arm as the shawl crosses. It’s just how I like a shawl. 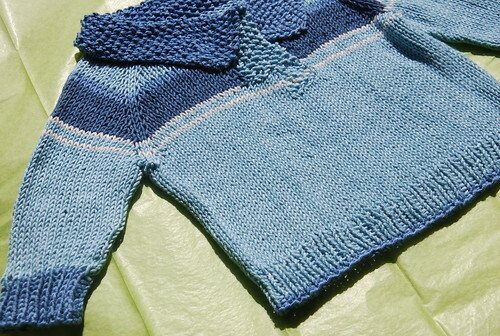 The home for this knit along is the Knit Wit group on Ravelry. We had a good lead time for blocking & also taking these pics. As I told the group, this one will see lots of wear in the cooler weather. 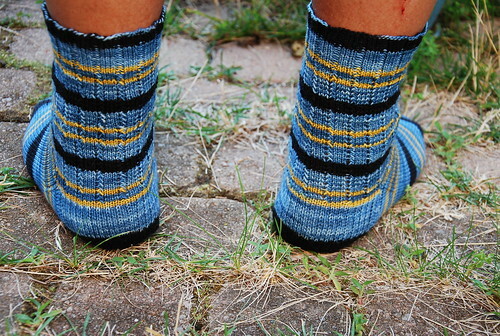 New socks of unusual size (9″ circumference) are off the needles! As soon as I saw Turtlepurl’s post for her Live Long & Prosper in this self-striping pattern, I had to get it for N. It is a 75% superwash merino/ 25% nylon blend, and I used 2.25 mm double-pointed needles. He is smiling in this picture, and approves of the finished socks. 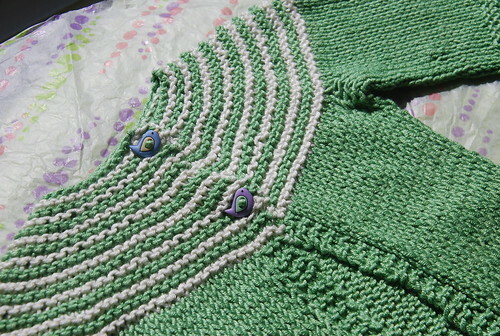 The columns of stitches are just paired slip stitches passed over knit front & backs. Easy to work, and perfect for other plane trips this spring. 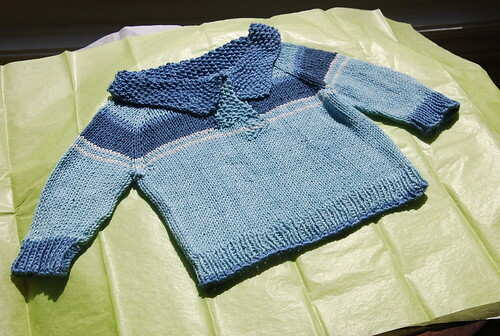 The last finished thought is this version of a Telemark 2.0 pullover that I made for our baby cousin in Montreal. 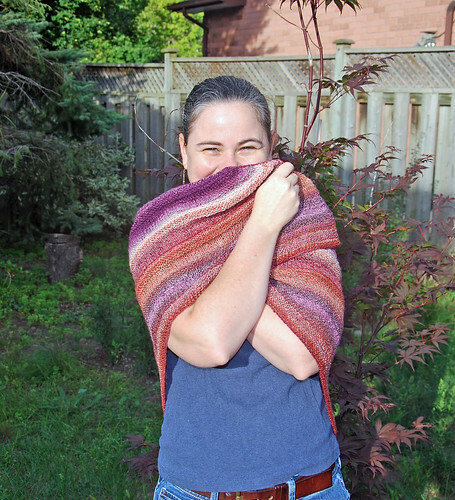 It was a nail-biting use of more from my Sirdar Baby Bamboo yarn stash. Is the placket reading as weird to you as it is to me? It might be a comprehension problem on my part but I did try to follow the instructions as written there. It has been on its way this week, and I hope they like it. Spindles are on the front burner again. Next month I will lead a guild workshop, and I am preparing the materials. 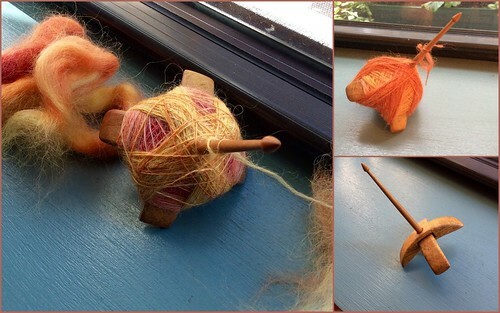 It’s a full 4-part introductory workshop, and we will go from first steps to plied yarn. It’s my first formal teaching, and I am so excited. In my down-time, I can play with this tulipwood Lark spindle by Jenkins Woodworking. Luckily, I missed 2 others for sale last week because this was offered in Ontario. Quick flight, no foreign exchange issues, and I love the tulipwood! The Delight in the travel collage above is 5g heavier at 28 g. Its arms sit low on the shaft (the Lark is mid-shaft), and are approximately 2 cm wide x 8.75 cm long. The Lark’s arms are a slim 1.25 cm wide x 9.5 cm long. The slighter profile is great for winding-on, and will hold that much more of a cop is my guess. Categories: Finished & in the wide world, Getting the knack, Holidays Happen, Spinning, Spinning Guild, What I'm up to | Tags: Baby gift, bead embroidery, beading, cardigan, drop spindle, handspun yarn, Hat, Shawl, Sock, Spinning, sweater | Permalink. I love your shawl and baby sweaters. I found your blog by searching “drop spindle” I am impatiently waiting for my first drop spindle to arrive in the mail. I’m following you in hopes of seeing tons of CRAFTY goodness in the future. Nice to meet you. Thank you! Best of luck learning with your new drop spindle, and hope you continue to enjoy my posts! Looking forward to seeing your work as well!